A survey has revealed 84 per cent of gym-goers confessed to taking selfies while at the gym, while 44 per cent admitted their body confidence prevented them from exercising. Buytshirtsonline recently surveyed gym enthusiasts in the UK about their gym perceptions and whether looking good at the gym really is important. We didn’t have to look far to discover people’s motivation for wanting to look good at the gym, as 84 per cent of respondents confessed to taking selfies while ‘working out’. Over one third (37 per cent) of gym-lovers wouldn’t hesitate to share their gym progress on social media. 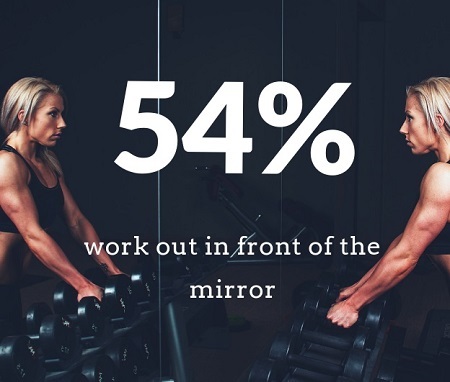 Exercising in front of a mirror is personal preference, and although sometimes it can’t be avoided, over half (54 per cent) of people asked admitted to working out in front of the mirror while at the gym. Various factors influence gym-goers to look at themselves while exercising such as refining technique and posture, but do all gym-goers think the same? Or are they more inclined to ensure they look good rather than exercise correctly? It’s not just the young people that have been stricken by self-importance, as the survey revealed 60 per cent of the over 35’s also want to look their best while working out. Over in Northern Ireland, a staggering 83 per cent of gym-enthusiasts believe looking good during a workout is essential. Gym members today love to accessorise with 40 per cent of respondents claiming to own specified gym gear and perceive them as ‘cool’. While 34 per cent of gym-goers admitted to always buying new gym gear. 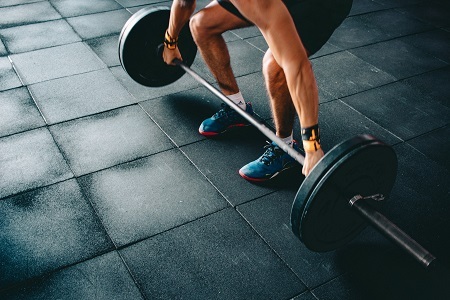 When asked the main reason for joining the gym, it’s no big surprise that the most popular reasons included strength and muscle building (32 per cent), weight loss (23 per cent) and to maintain a healthy lifestyle (23 per cent). When comparing ages, 67 per cent of the over 45’s will go to the gym to stay healthy; 40 per cent of 18-24-year olds joined the gym to build muscle and strength; 30 per cent of 25-34-year olds’ goal is losing weight. Amongst the relentless striving and posturing, there is a more concerning element for the new generation of image-conscious gym members. Almost half of respondents (44 per cent) admitted that their body image had prevented them from exercising. This number was higher amongst females (53 per cent) and 32 per cent of males shared the same anxieties. 20 per cent feel self-conscious about sweating during a workout. With the rapid growth of social media, it’s no surprise that gym-goers in the UK have a ‘gym-style icon’, especially amongst the 18-24-year olds. Gym-style icons include Kayla Itsines, Dom Mazzetti, Grace Laid, Heidi Summers, Hannah Fallis Bronfman and James Duigan. Has the UK gym-member population become too self-obsessed with the way they look at the gym and to their peers? Are they influenced by the media and celebrity icons to look good? Is the perception to look good at the gym steering away from the real reason for joining the gym – to exercise, achieve goals and maintain a healthy lifestyle?